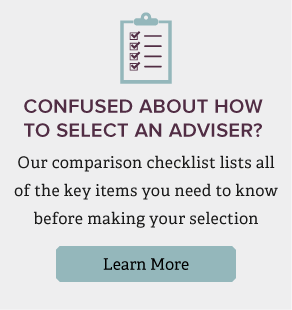 Choosing a Financial Adviser is one of the most important decisions of your financial life. The person you select will have a direct effect on your financial future. It’s hard to know what qualifications matter, who to trust and how to move forward. We understand. Advance Capital Management has spent nearly three decades building trust with our clients and an excellent reputation in the marketplace. Most of our clients need answers to several questions before they‘re ready to commit to a relationship with one of our financial advisers. Below are the most common concerns that our clients share with us. Trust is often the biggest influencer in the decision to work with a Financial Adviser. You need to know that the person you select will act in your best interests at all times. The best way to ensure this is to hire a Registered Investment Advisor (RIA) firm which functions as a fiduciary. A fiduciary is obligated by law to act and make recommendations that are always in the client’s best interests. Advance Capital Management is proud to be a fiduciary organization. While there are no guarantees, it’s important to select a registered investment advisor firm with the expertise and proven background to demonstrate capability. Track record and longevity are good indicators that an RIA firm is credible. Our results have been verified as in compliance with the Global Investment Performance Standards (GIPS). Advance Capital Management has been helping people manage their financial lives for nearly three decades. We were recognized as one of the top ten largest money managers in Michigan by Crain’s Detroit Business. There are different fee structures available in the industry. Many non-fiduciary financial advisers are obligated to sell certain investment products and receive compensation from those they sell—even if they may not be appropriate for your overall financial goals. When making your selection, look for a firm that is upfront and transparent about their pricing. Advance Capital Management follows a low pricing model. Learn more about who we are and our philosophy. Advance Capital Management, Inc. was established in 1986 and is an SEC registered investment adviser. The firm provides investment advice to many types of clients including individuals, investment advisers, investment companies, pension, profit sharing and other forms of retirement plans, trusts, estates, charitable organizations and corporations. The firm is owned by Advance Capital Group, Inc.
Advance Capital Management, Inc. claims compliance with the Global Investment Performance Standards (GIPS®). To receive a list of composite descriptions of Advance Capital Management, Inc. and/or a presentation that complies with the GIPS standards, contact John Pelon at (800) 345-4783, or jpelon@acadviser.com.